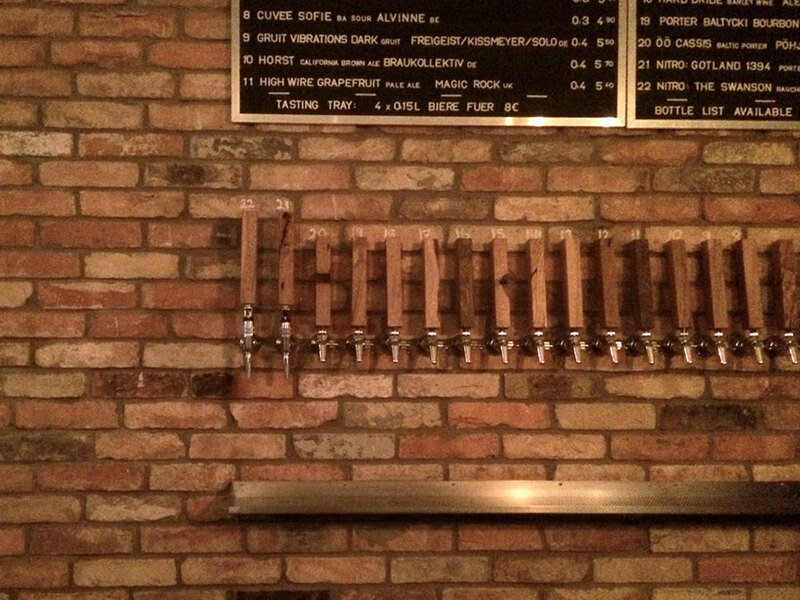 If ever there was a quintessential new Berlin beer bar, it would be Muted Horn: situated between a discount Penny supermarket and a mosque, Neukölln’s latest craft beer bar is run by two Canadian expats. Which makes sense, considering their extremely well-curated selection of Canadian beers. If 22 taps seem like too much, choose the flight of four beers for 8 Euro. Pricing tends to lean toward the generous here, water is 1,20 Euro (if you decide against tap of course) and a 4cl long drink will only set you back 4,50 Euro. Walking up from the Neukölln Arcaden, follow the glow of the blue horn and you'll find yourself in Neukölln’s latest craft beer destination. The Muted Horn takes its beers very serious. A nice selection of, always rotating, 22 beers on tap as well as more than 80 bottled beers. And there are some real gems amongst them, like the cinnamon, coconut, vanilla, and coffee-infused Imperial Stout as well as some serious Belgian Lambics (a personal favorite! ), that’s only served in four bars worldwide. If you’re anything like me, you might have some commitment problems. For those of you, it's probably best to stay off of dating sites and to go with Muted Horn's tasting flight, which offers four freshly tapped beers for 8 Euro. Also great for those of us who can’t decide between a sour, a smoked Berliner Weisse, or a White IPA. The whole point is to showcase beer’s complete facet and teach the Neuköllner a thing or two about beer diversity. This teaching ethos goes behind serving us plebs a freshly tapped brew here and again, The Muted Horn hosts these fantastic events called the “Lambic Sunday”, they do tap takeover and organize workshops at the bar. Best to keep up with their very busy schedule on their Facebook page. The bar’s interior design must have been constructed with some serious Scandinavia obsession in mind. Very structured, wooden, and heavy on the granite. The Scandinavian coolness might feel a tad too standoffish at times, particularly when you’re not there during peak hours it can almost feel a bit too lonely, but it does allow the beer to shine and it’s a definite improvement over the my-grandmother-died-and-now-I-use-her-furniture-to-decorate-my-bar vibe. The backspace also has a couple of sofas on hand, which allows for a minimum amount of coziness. If you’re into games, the Muted Horn will supply you with a whole host of board games. In case you’re wondering about the bar’s name: that was inspired by Thomas Pynchon's classic, post-modern satire "The Crying Lot 49". And there you have it. Games, beer, and some post-modern intellectualism. All in one bar. Spaziert man von Neukölln Arcaden hoch oder von der Boddinstraße hinunter und folgt dem blauen Schein des Horns, landet man in einer von Neuköllns neueren Craft Beer Bars, dem Muted Horn. Und hier meint man es ernst. Zwei Kanadier aus Vancouver haben sich in Neukölln niedergelassen und eröffneten im vergangenen Jahr das Muted Horn, direkt neben dem Penny und einer Moschee. Hier gibt es wechselnd 22 Biere vom Hahn und dann noch einmal mehr als 80 Biere aus der Flasche. Darunter so manche Seltenheit, was beim über Zimt, Kokos, Vanille und Kaffee gereiften Imperial Stout anfängt und beim belgischen Lambic, das weltweit in nur vier Bars ausgeschenkt wird, wieder aufhört. Für Menschen mit Commitment-Problemen gibt es das Tasting Tray mit vier Bieren vom Tab und das für 8 Euro. Sour, smoked, Berliner Weisse und ein White IPA? Bitte, gerne. Es geht darum, den Neuköllnern, Berlinern, ach, den Deutschen, den ganzen Facettenreichtum der Biervielfalt nahe zu bringen. Das passiert zum Beispiel auch in Workshops oder Veranstaltungen im Muted Horn, wie dem “Lambic Sunday”, diversen Tap Takovers undundund. Dafür am besten die Facebook-Seite im Blick behalten. Stilistisch ist das Interieur in zwei Worten zusammengefasst: Holz und Stein. Eine skandinavisch anmutende Kühle bestimmt die Einrichtung des Muted Horn, Platz nehmen lässt es sich entweder am Bartresen oder im hinteren Teil der Bar etwas gemütlicher auf dem Sofa. Da kann man neben dem Bier ein Gesellschaftsspiel genießen, wovon es im Muted Horn eine riesige Auswahl gibt. Noch etwas Angeberwissen am Schluss. Der Name der Bierbar kommt aus dem Buch “Die Versteigerung der No. 49” von Thomas Pynchon.